Will Robinson Crusoe (Sumner) Forsake His Man Friday? The Boat’s Crew That Is Going Over” appeared in the April 20, 1872 issue of Harper’s Weekly. 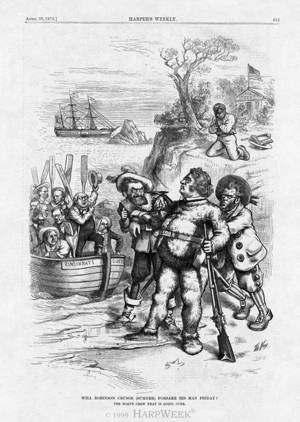 The Boston Daily News called it “decidedly one of Nast’s best.” In it, Liberal Republican Senators Carl Schurz and Thomas Tipton attempt to nudge their intractable Massachusetts colleague, Charles Sumner (as Robinson Crusoe), into accompanying them in the “Cincinnati Convention” longboat, which is destined to join the schooner, Democrat, anchored in the open waters. Sumner, a leading promoter of black civil rights, stiffly avoids eye contact with Horace Greeley and his crew. Sumner/Crusoe’s man Friday, representing black voters, prays on the cliff, with a “Lincoln School” in the background and the Ku Klux Klan lurking behind a tree.